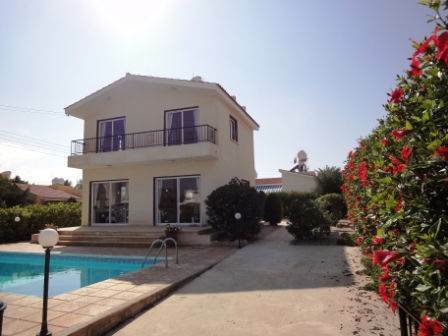 Coral Bay Villa, Paphos – This 3 bedroom detached villa sits on a corner plot at the end of a quiet residential cul-de-sac. Because this location is only 200 meters from the beach and also within easy walking distance to local restaurants, it is one of the most sought after areas of Coral Bay. The ground floor features a spacious open plan living area with corner kitchen, which is nicely separated from the dining area by a breakfast bar. Near the stairs is a guest cloakroom. The living room is light and airy with windows on either side, and patio doors lead on to a partially covered terrace overlooking the swimming pool. Upstairs there are three good size double bedrooms, all with fitted wardrobes. The master bedroom has an en-suite shower room, and bedroom 2 and 3 share a family size bathroom. Patio doors from the master and bedroom 2 lead onto a long balcony with views of the surrounding area. Steps lead down from the raised veranda to the swimming pool terrace, where there is plenty of space for relaxing in the sun. The mature landscaped gardens provide privacy to the pool area and rear garden, and a long driveway has parking space for at least two cars.